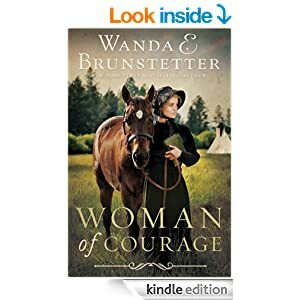 Woman of Courage, by Wanda E. Brunstetter, is set in pre-Civil War America. It is a tale of a young Quaker woman named Amanda Pearson, who, after being rejected by her fiancé, decides to set out on a cross-country journey from New York to Oregon Territory to become a missionary to the Nez Perce Indians. Along her journey she suffers personal losses, a near fatal injury and is rescued by a man named Buck McFadden. McFadden takes her to another trappers cabin where Amanda meets a young Indian woman and her white, trapper husband. As she recovers from her injuries, she is able to share the love of Christ with each of them. The book ends with Amanda eventually completing her journey to the Oregon territory, with some surprising twists along the way. While I did not care for some of the twists, I cannot deny Ms. Brunstetter’s ability to keep the story flowing and the reader interested. She weaves a dramatic tale of loss, gain and learning to trust in the Lord Jesus. I received a copy of this book from Handlehar Publishing in exchange for an honest review. Thanks to my friend Ashleigh for this great review!